For countless years, the legendary bar Kitty O’Shea’sat the Hilton & Towers Hotel in Chicago has been the favourite meeting place for the revellers of the annual Midwest Band & Orchestra Clinic. Since my first visit in 1990, I have not missed a year, and I always look forward to going there again. At Kitty O’Shea’s, new friendships are formed, old ties are strengthened, plans are created (most of which will not be carried out), the laughter is contagious and many toasts are made. During my first ‘Midwest’, in a whirl after winning the Sudler Award with my Symphony no. 1, The Lord of the Rings, I became friends with Max McKee. He is of Irish descent, and he asked me to write a suite based on the folk music of his ancestors. Many years later, Max and his American Band College created the consortium that commissioned At Kitty O’Shea’s. I have seldom worked on a project with this much pleasure. It was a difficult task to choose from the abundance of traditional Irish folk music. By the time I had 16 minutes of music ready, it was time to finish the work – but I have plenty of material left for a follow-up! 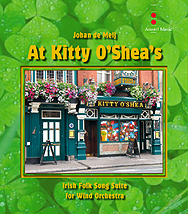 I would like to share an interesting story about the making of At Kitty O’Shea’s. I had just started my research on original Irish tunes, when I noticed someone in our Manhattan apartment building had posted an ad to sell their espresso machine. I went to my neighbour’s spacious penthouse – determined not to pay the asking price. A friendly gentleman let me in, and we soon engaged in lively conversation -- talking about how great it is to live in New York, about our roots, etc. After he had told me he was of Irish descent, I asked him whether he knew of a local institute where I could find more information about Irish folk music. 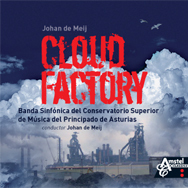 When I explained what I was working on, he said: “What a coincidence, I’m a composer too. I’m Bill Whelan, the composer of Riverdance. Why don’t you sit down, we must have a lot more to talk about.” Of course I knew his name and his wonderful music, but I didn’t know what he looked like. I felt as if I had just asked Roger Federer if he might know someone who has some knowledge of tennis! was composed by Roscommon-born Percy French (1854 - 1920), among the most popular and prolific of Irish comic songwriters. Irish children used to play a game in which they would light the tips of sticks in a fire, each player swinging this deirín de around while singing a nonsense song set to this melody. The winner was the child whose stick was the last to burn out. is one of the most common in the Irish tradition, long used both as a song air and for dance tunes of various rhythms. It is best known today as the air of Cathal MacGarvey’s song The Star of the County Down. is a so-called ‘macaronic’ song, which mixes the Irish and English language, and dates from the mid-19th century.Siúil (pronounced like shool) means to walk or ramble. is a parlor ballad published in 1879, with some of the flavor of traditional music. It is attributed to James Lynam Molloy (1837 - 1909), who borrowed the first section from The Cuckoo, a 1790 song published in London by a Miss Margaret Casson. It was featured in the soundtrack ofThe Quiet Man,a hugely popular American film of the 1950’s starring John Wayne and Maureen O’Hara.